A few weeks back, I was at my IL’s place with D. D’s favourite activity there is to watch Doraemon episodes on Disney Channel. I don’t mind if she watches Doraemon, the characters are cute and funny. My main problem is the sheer volume of ads being played within a span of 30 minutes. D gets introduced to all new junk foods whenever she watches Disney Channel (grrrrr!!!!). One such ad that makes me so angry is Sunfeast’s Dark Fantasy Choco Fills. I’ll come to the ingredients shortly but what irritates me the most is the theme "Can’t wait, won't wait”. What kind of a message are they sending? That if we want something, we had to get it right away? The children of current generation are already facing the brunt of instant gratification offered by various gadgets and games. This ad’s message seems to emphasize it even more. As a mother, I find it extremely challenging with D, if I had to make her wait for something. But we continue with our effort as much as possible. Ability to delay gratification through self-control is considered as one of the most important criteria for success in life. Read more about the Stanford Marshmallow Experiment (A must-read for all parents). That’s something to ponder over. 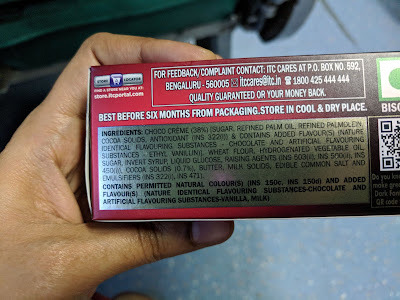 Yep, the typical junk food profile with all expected ingredients - maida, sugar, hydrogenated oil, refined palmolein, various artificial additives, flavors and colours. As I wrote about in my post on JimJam biscuits, sugar gets added in various forms - invert syrup, liquid glucose. 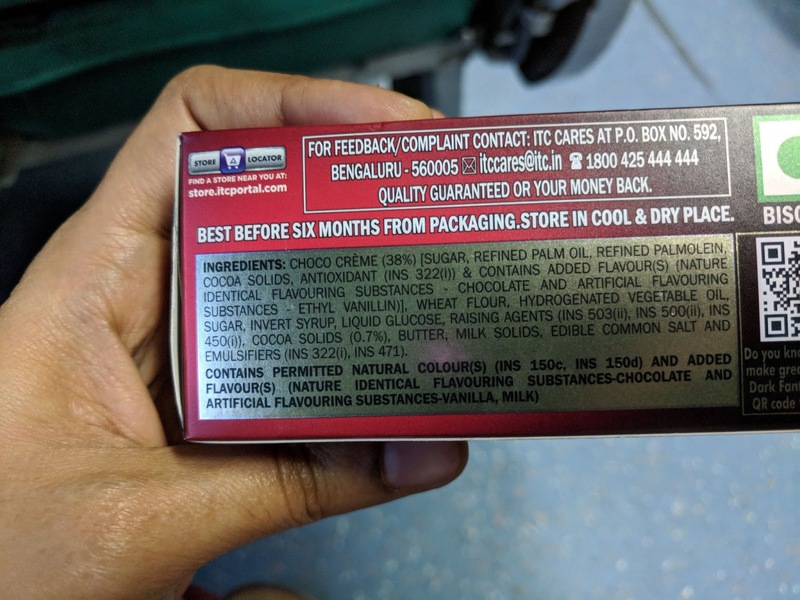 A 30Rs chocofill pack (75gm) contains 6 packs (12.5 gm each). 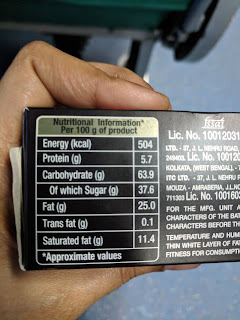 According to the nutrition facts table, 100 gm of product contains 37.6 gm of sugar. Let’s calculate what it means for each pack. Each chocofill contains 4.7 gm OR a little more than a tsp of sugar. Compared to its equivalent “Lotte Choco Pie”, the sugar is relatively lower, primarily because of the difference in pack sizes (12.5 gm v/s 28 gm). Each chocofill contains 3.125 gm OR a little less than a tsp of unhealthy fats. 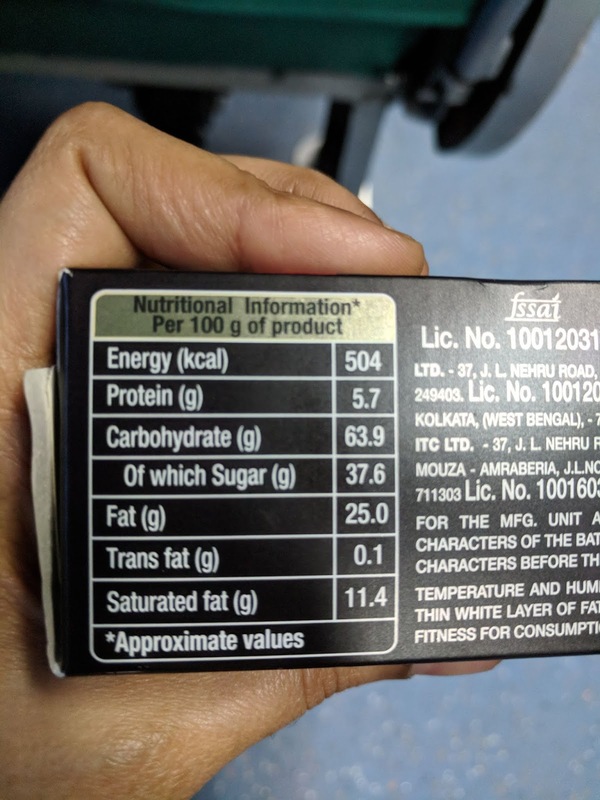 Yes, it contains trans-fats as well, though the quantity is less (0.1gm in 100 gms). Since this comes in individual packs, many moms choose to pack it in their kid’s snack box. I wish all schools would enforce a strict “no-junk” policy. Even if schools don’t do that, I wish moms follow a rule for themselves that they wouldn’t pack any junk in their kid’s tiffin.